Following the brow of the caldera, you reach Firostefani, from where you have the best panoramic view on the volcano. The cliff here becomes so steep that it cuts your breath! And, by all means, you have to visit the Conference Center Petros M. Nomikos (tel. +30 22860 23016/19), where the three-dimensional photographic reproductions of the Akrotiri wall paintings, are all presented together! Between Firostefani and Imerovigli is situated the Monastery of Agios Nikolaos, founded in 1651 by the Gyzis family and dedicated to Agios Panteleimonas, Zoodohos Pigi (Spring of Life) and Agios Nikolaos. Tip: On the way to Kamari is the Wine Museum (telephone +30 22860 31322) housed in the Volcan Wines Winery of the Koutsagionnapoulos family. 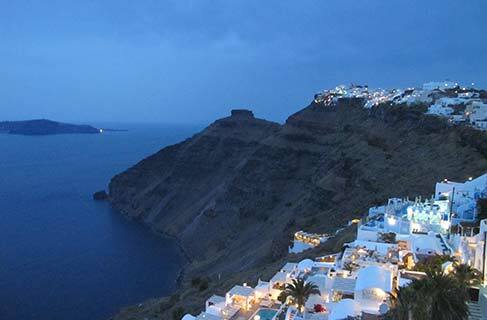 Here you have the chance to learn everything about the history of the Santorini wine from 1660 to 1970.